Domestic Perversions proposes to reflect on the possibility that anyone can create their own devices for pleasure through subversion of everyday objects, and thus generate a new imaginary and new symbols of desire. This installation took part in the exhibition Habitar la Intimidad II, curated by Rosalía Jordán, in 2016. The subversion of everyday objects present in domestic spaces to generate perverse devices. A reflection on how anyone can develop their own pleasure tools, according to their own wishes and needs, using objects that we all have within our reach. 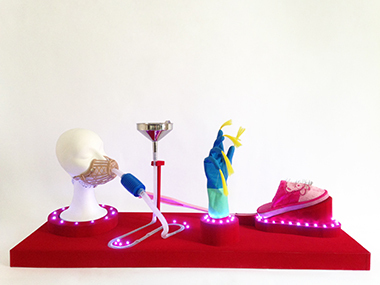 Its visual structure is developed through a process of DIY, collecting and combining materials of disparate uses and then incorporating them into a production process of imaginary and new symbols of pleasure. The resulting aesthetic is based on negotiations between the different elements and its group generates scenarios radically opposed to the standards for which they were designed.